Good afternoon EBC family. I hope you are enjoying this great summer weather. One exciting development for me this summer is that I’m beginning my doctoral work. I’m part of a cohort of 25 pastoral leaders from around the country who gather together for 10 days each summer for an intensive study week. This year I’ll be studying at Fuller Seminary in California from June 17-27. I am deeply appreciative for the financial and spiritual support that makes this possible! I also know that summer can be a busy season and I want to help you stay connected. If you are out of town, be sure to check out our app (effortchurch.us2.list-manage.com/track/click?u=55bc224aced3f0c7f2e3e1952&id=73d178c215&e=6706db6359) or website to watch the Sunday service. They are usually posted on Monday and, very soon, we’ll start live streaming. Also, make sure you check our Facebook page to stay in the loop. When you’re traveling with friends and family, take advantage of these options to help you stay connected with your church family. We see Jesus moving within our church. 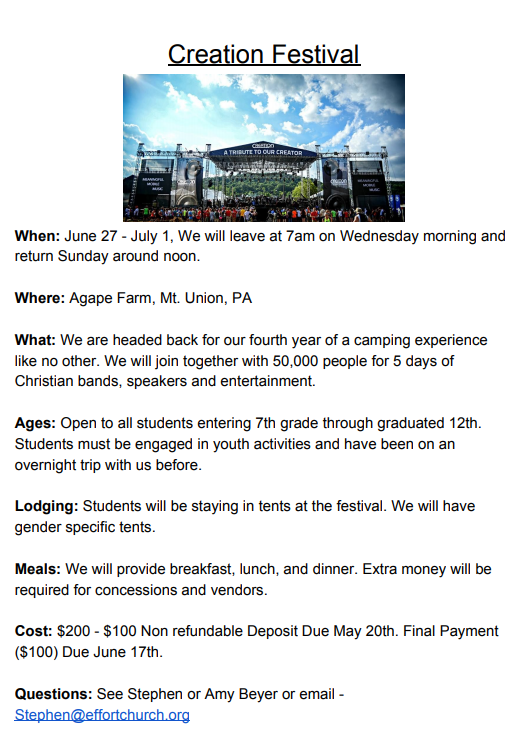 I can’t wait to see lives change this summer. 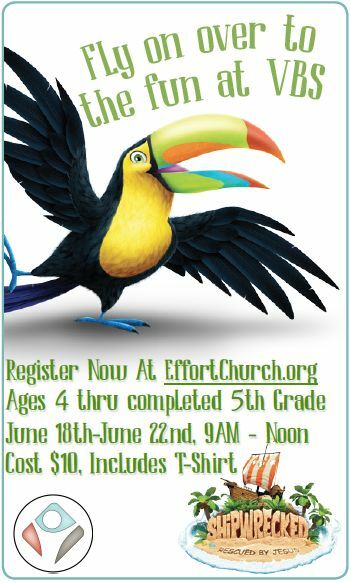 CLick on the image below to register for VBS! Just a few tickets left for Creation Fest! You can help by checking out this list of needed items to loan or donate).